Getting groceries is quite the trip from the North Rim. There is a small campground general store and a “North Rim Store” just outside the park but they don’t carry more than snacks or canned goods. Though the general store here has a whole isle of bread, I guess for lots of sandwiches when camping or hiking. So the solution is to drive to another state: Utah. The town of Kanab is about 85 miles from here and a lot hotter at 97 degrees yesterday. On the way back I stopped at Jacob Lake, at 41 miles, the town closest to the main park entrance. 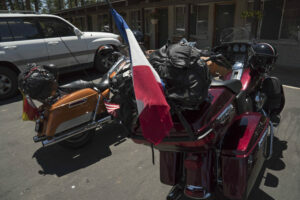 It consists of the Jacob Lake Inn, which is a “Café Motel Curios Store”. The counter at the restaurant is nice so I had lunch. 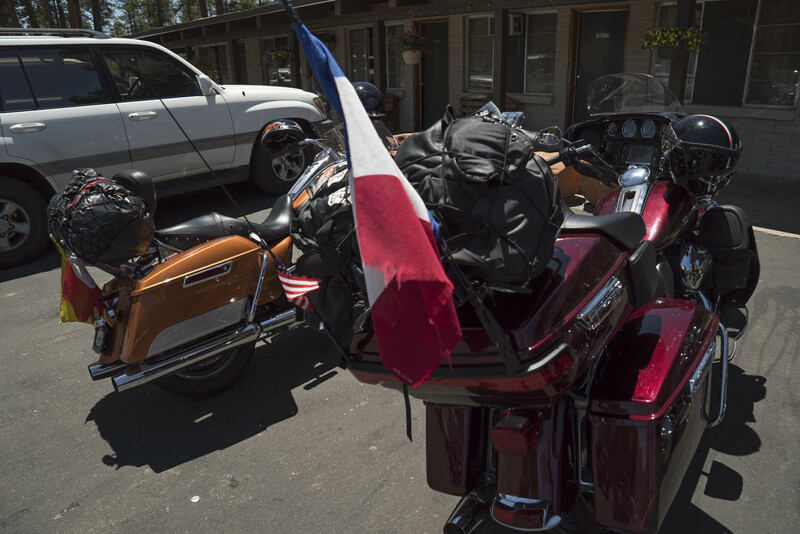 I noticed a group of French tourists inside, turns out they are Harley-Davidson riders, flying the tri-color from their motorcycles. Saturday night’s trio of the moon, Jupiter and Venus. 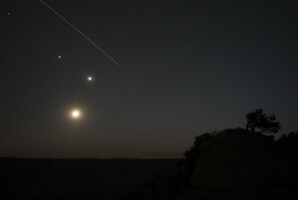 Friday night’s ISS flyover past the Jupiter-Venus-Moon grouping. As the moon waxes I’m hoping to get some of the canyon lit up to get the stars and the canyon in one photo. 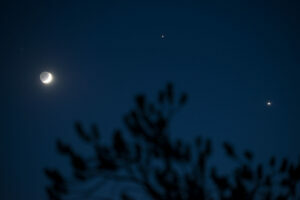 The last two days have been good for photographing the moon itself as it aligns with Jupiter and Venus. For the last few weeks the planets have come closer together and created a diagonal line as they set in the west. (You can see this even in cities.) Friday they were joined by a crescent moon with the planets on top. Saturday the moon was to the left, forming a slightly tilted triangle. Compare the shot from Saturday which shows “Earthshine” on the unlit portion of the moon to the Friday photo which has the International Space Station flying by the trio. (I followed the cropping advice for the ISS shot from Ken Spencer, who has a Ken Spencer that I think he’s been doing for over 6 years!) Almost forgot to mention, if you look very closely at Jupiter (on the top) in Saturday’s image, you can see 3 of the planet’s big moons. 9:40pm view from Cape Royal. 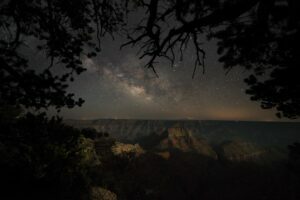 Here’s an attempt from Saturday night of the canyon and the Milky Way from Cape Royal. The only disadvantage of shooting from the North Rim is that you get the South Rim lights in the picture. There is some glow on the horizon from towns and the pinpoints of light on the rim are car headlights along the Desert View Drive.